The statue was presented by France, in commemoration of 100 years of American independence. However only one arm was available in 1876. 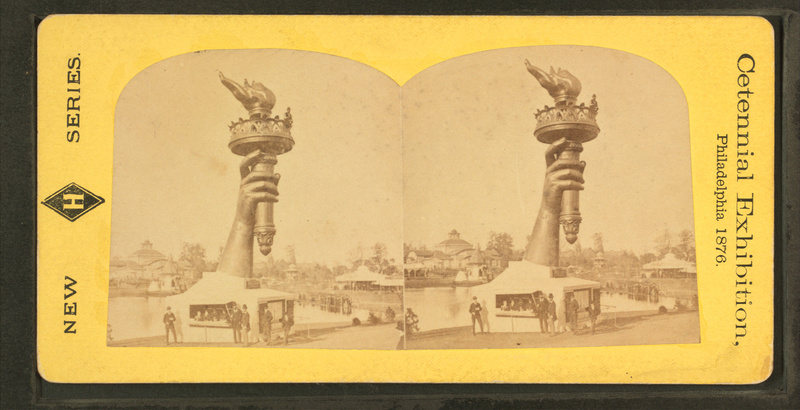 The hand and torch of the Statue of Liberty had been displayed at the 1876 Centennial Exposition in Philadelphia, and then shipped to Madison Square New York for display. Fundraising for the platform took some years to complete, finally being organized by Joseph Pulitzer. EJ Phillips seems likely to have seen the arm in Philadelphia during the Centennial -- and she almost certainly saw it in Madison Square Park since she was working at the Madison Square Theatre at the time. John [Dolman] is here. Came this AM, took advantage of the cheap excursion tickets today - takes the 12 train tonight to return. We have had a wretched day for the celebration, a drizzly rain all day. I guess the fireworks will be postponed. Lottie [Powell] was here this afternoon. She was on the grandstand this morning with the President [Grover Cleveland] of the US, and all his cabinet and the foreign officials. She had a grand view of the whole affair. Hattie called on Alice [Zavistowski Webb] on Tuesday. Alice was glad to get back to America. Had a rough passage coming back. Aunty is weather bound in Linden so poor Uncle is alone in his lovely home. I got my salary yesterday, but only a few of us did. I shall not send you any tonight, for I have to get shoes, stockings, flowers, bonnet, gloves &c &c to Jim the Penman and when I get through, I will see how much I have left to send you. Frederic Auguste Bartholdi (1834-1904) was the sculptor of the Statue of Liberty. It was unveiled and dedicated by Grover Cleveland on Oct 28 in a ceremony on Bedloe's Island. The statue was presented by France, in commemoration of 100 years of American independence. However only one arm was available in 1876. The hand and torch of the Statue of Liberty had been displayed at the 1876 Centennial Exposition in Philadelphia, and then shipped to Madison Square New York for display. Fundraising for the platform took some years to complete, finally being organized by Joseph Pulitzer. EJ Phillips seems likely to have seen the arm in Philadelphia during the Centennial -- and she almost certainly saw it in Madison Square Park since she was working at the Madison Square Theatre at the time. The Dolmans were friends of EJP's long before Hattie married John, and seem to have known John Nickinson as well.. John Dolman Sr. (1824/30?-1895) was Hattie's father- in- law. He made his professional debut at Mitchell's Olympic Theatre, New York in 1849 and retired from the stage at the Arch Street Theatre, Philadelphia in 1860, to become a lawyer.